Here is another panel from Daredevil #12, suggested a while back by fellow DD fan Francesco (*waves*). This panel is funny for a couple of reasons… First of all, shouldn’t DD get his priorities straight? He approaching an island with a giant skull taking up roughly eighty percent of the surface. The island, as you’ll see, is appropriately named Skull Island. Whatever surface isn’t covered by a gigantic skull is set ablaze. 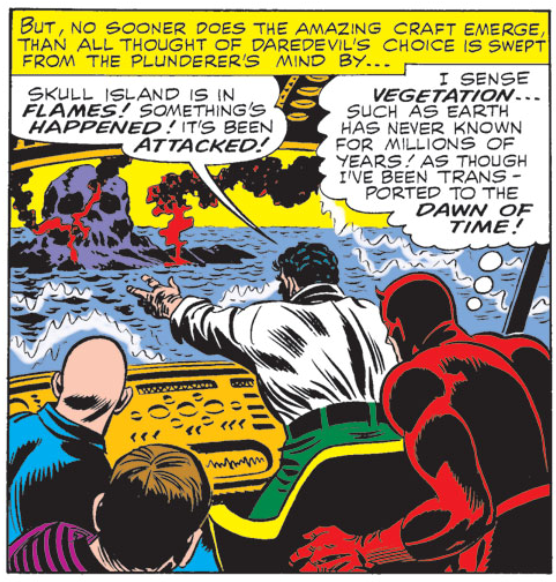 Rather than concentrating on the more immediate issues, Daredevil comments on the type of vegetation present. Again, aren’t all the plants burning at this point? This makes me think that young (sighted) Matt was a dinosaur nerd, absorbed in study of the apatosaurus and Jurassic flora. I love this blog XD. Matt must’ve been way more than your average teen dinosaur nerd, if he even researched on how those things would smell (to the extent that he could even recognize them beyond doubt in the improbable hypothesis tha he would stumble upon them in the future). Nah, I think I’m going with the “plant smokes” interpretation given at the end of the post here.